Although people may think golf is a less-intensive physical sport, teeing it up is actually associated with a number of injuries and pain problems. Many golf-related injuries result from poor mechanics or overuse, putting pressure and strain on the body. Even the most casual player can sustain injuries. The rotational swing places considerable stress on the spine and muscles. The repeated motion and the golfer bent-over stance can easily lead to back injury. In golf, tendinitis is known as “golfer’s elbow.” The swing motion in golf can put stress on tendons and cause tendinitis. 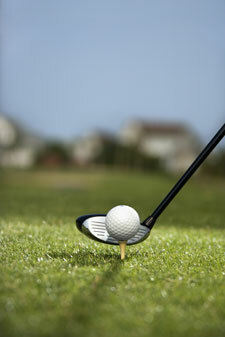 Golfers who like to practice hitting golf balls are susceptible to golfer’s elbow. Neck injuries are also common in new golfers, as the body isn’t used to the twisting motions involved in the sport. It’s not uncommon for the neck muscles to shorten and result in neck spasm. The hip joint is vulnerable during the game of golf, as the swing entails pivoting and twisting movements. There are both adduction and extension forces that can result in hip injuries along with low back injuries and groin strain. At Fraum Chiropractic Life Center, we treat all types of sports injuries. Initially, we perform a comprehensive physical exam along with X-rays. Once we’ve identified the root cause of your pain, we develop a treatment plan that is custom-tailored to your diagnosis. Treatment may include spinal adjustment, exercises and stretches and other therapies. Spinal manipulations entail a manual, gentle force applied to the cervical or lumbar area to properly align the spine’s components. It relieves pressure caused on the spine’s nerves and muscles. Many patients experience some degree of pain relief after just one spinal adjustment. At Fraum Chiropractic Life Center, we will create a holistic treatment plan that is multi-faceted for optimal results. Whether you’re a golfer who has sustained a recent or you have incurred an injury due to another sport, call and schedule an appointment with our Hilton Head Island chiropractor. Recovery begins with our individualized treatment plans. Reach out to us at Fraum Chiropractic Life Center to get started!